golden hash browns stuffed w/ your choice of ham, bacon, or sausage, grilled onions, melted cheese, & sausage gravy. served w/ toast. 2 eggs, ham, bacon & sausage, hash browns, toast & 1/2 biscuits & gravy. fried potatoes w/ grilled onions & peppers, topped w/ ham, bacon, & sausage, two eggs, & smothered w/ our homemade sausage gravy. served w/ toast. 2 eggs, hash browns, ham, bacon, or sausage, & toast. 2 cakes w/ham, bacon, or sausage. hash browns, ham, bacon, or sausage, & 1/2 order of biscuits/gravy. 2 eggs, ham, bacon, or sausage, & toast. steak, potatoes, 2 eggs, & toast. cheese balls,‏ mushrooms, onion rings, w/ ranch dressing. check w/ your server for today's selections! Nice local small town restaurant. Staff were really friendly. Large seating area, clean and food was great! 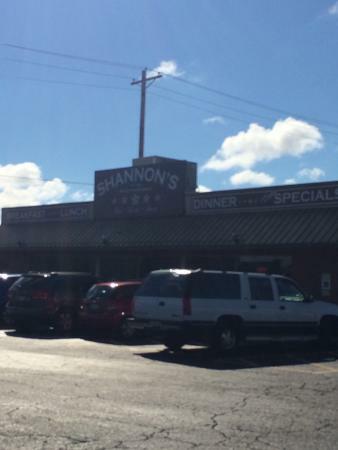 Coming through B/N called friends they said meet us at Shannon's. Glad I did. Special was meatloaf and mashed potatoes...yum Stick to your ribs kinda meal. 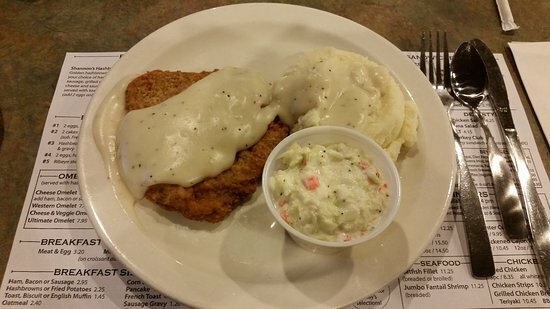 Large portions, great service. Easy to find location on Veterans Pkwy. I'll be back. Hard Pass. Mediocre food. Horrible service. And as my toddler says- "sticky mess". Very warm and welcoming. The service was outstanding - efficient and friendly. The food quality was fantastic. I would highly recommend this restaurant! I have friends who love breakfast here, but it has never really impressed me. 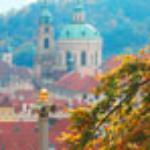 The service is good, and the food is okay but isn't anything special in my opinion. There are many other breakfast places in the area that I greatly prefer. 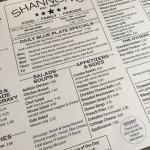 If you set your expectations right, Shannon’s will deliver just what you’d expect from a local diner in rural America. I have only been here twice. Both times for Easter brunch. The food is what you would expect for a breakfast place. Nothing special, but decent. Get quick answers from Shannon's Five Star staff and past visitors.